Mama Fashionista: Celebrate Earth Day with ORICO LONDON! 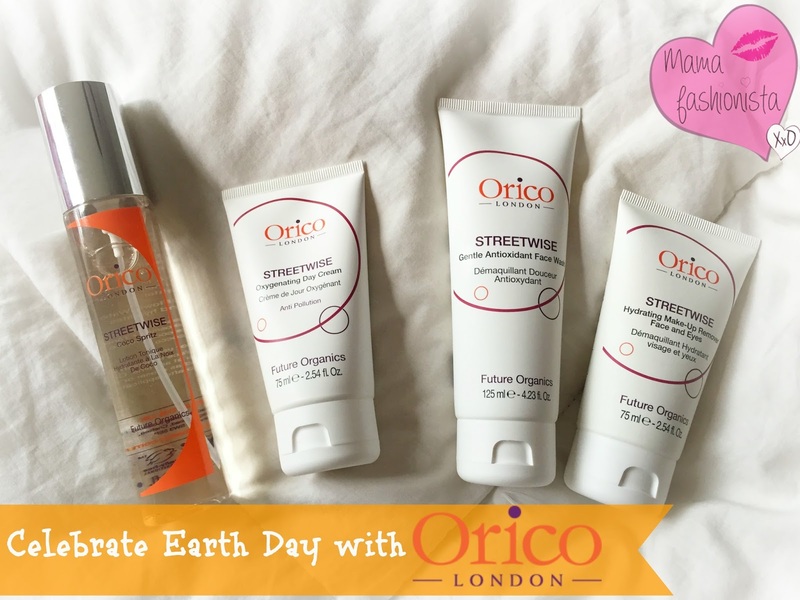 Celebrate Earth Day with ORICO LONDON! STREETWISE CITY FACE SCRUB ($36; not pictured) - The newest addition to the Streetwise family is a deep cleansing facial polish formulated with natural exfoliating and rejuvenating ingredients. Coconut Shell Powder gently removes dead skin cells and city grime while moisture-retaining coconut oil purifies the skin, keeping it soft and hydrated. STREETWISE COCO SPRITZ ($37) - The ultimate beauty multi-tasker: rehydrates, detoxifies and enhances skin radiance. This natural hydrating mist toner is packed with Papaya & Mango fruit extracts to brighten skin while Orange flower water tones and cools to give a healthy-looking glow. STREETWISE OXYGENATING DAY CREAM ($45) - A daily city moisturizer with a clinical bioactive to help optimize cell respiration. All-natural antioxidants Macadamia and Argan oil helps to reduce wrinkles, restore moisture levels while firming. STREETWISE GENTLE ANTIOXIDANT FACE WASH ($22) - A daily face wash to cleanse the skin of city impurities and built up toxins. Formulated with a blend of anti-backterial Gingko Blioba and Orange oil, this natural cleanser gently but deeply decongests pores without stripping away any natural moisture. STREETWISE HYDRATING MAKE-UP REMOVER FOR FACE AND EYES ($27) - Gentle all-in-one hydrating balm to remove all traces of makeup and pollutants without leaving the skin dehydrated. Infused with Coconut Oil and Orange essential oils, this organic makeup remover effectively will clear skin of daily impurities while leaving skin superbly hydrated and revitalized. Each formula is a unique and synergistic blend of natural active ingredients and essential oils to protect and rejuvenate the complexion and give a lift to the senses. All of Orico’s products are certified organic and are entirely Paraben Free. The environment is very important to the brand which comes across not only in their products, but their packaging which is eco and environmentally friendly. Orico is also proud to sponsor the World Land Trust to promote the conversation of rainforests.